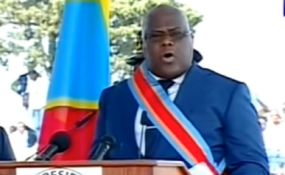 Felix Tshisekedi speaks after being sworn in as president of the Democratic Republic of Congo. Congo watchers say that the delay in forming a Cabinet and naming a prime minister since he was sworn in January 24 is as a result of horse-trading between his CACH Coalition and Kabila's Common Front for the Congo (FCC) over who gets what portfolio. "Tshisekedi is trying to show that he is in charge, but Mr Kabila has a long list of people who want to be paid back for their long years of loyalty," Stephanie Wolters, head of the Peace and Security Research Programme at the Institute for Security Studies in South Africa, told The EastAfrican. The new president's main headache is that his CACH Coalition only managed to get 46 MPs out of the total 500 while FCC has 337 MPs and are demanding the post of prime minister. Congolese who spoke to The EastAfrican refer to FCC as the "government side" which they cite for the delay in forming a government. In a recent tour of Namibia, President Tshisekedi hinted at his frustrations when he said that he will not accept being a "ceremonial" president. "How much independence can he really assert and how much risk is he willing to take to assert his independence?" asked Ms Wolters. "To cement the democratic advances achieved in our country, I have made reducing tensions a major goal. I will order the justice minister to take all necessary measures within the law towards conditional release of all individuals detained for opinion offences--notably during the protests held before the elections," President Tshisekedi said.